What's the best cure for those hot and humid Chicago summers? Sorbet! I am totally on a cool-treat kick. 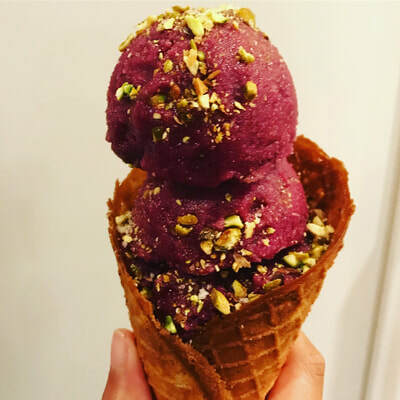 So I made a Prickly Pear sorbet, topped with a Citrus Pistachio sugar. That deep, rich color is amazing! My parents went to Arizona and brought me back a bunch of this amazing fruit. This was a special treat. I had had drinks with prickly pear before but had never actually made anything with it. Opuntia, more commonly known as prickly pear, is the fruit of a paddle cactus. This segmented cactus is one of the few in North America that is edible to humans. The pads are called nopales and are commonly found in Southwestern, Mexican and Mediterranean cuisine. The juice is really healthy. It is used by some Native Americans to treat burns and is eaten to treat ulcers, diabetes and inflammation. The fruit has lots of nutritional benefits. It is high in Vitamin B and C. It also contains magnesium, potassium, calcium and copper. It is rich in antioxidants, too. It is a cactus so it has hairlike splinters called glochids all over. When I harvested the juice I had to use heavy-duty gloves to keep from getting stuck. 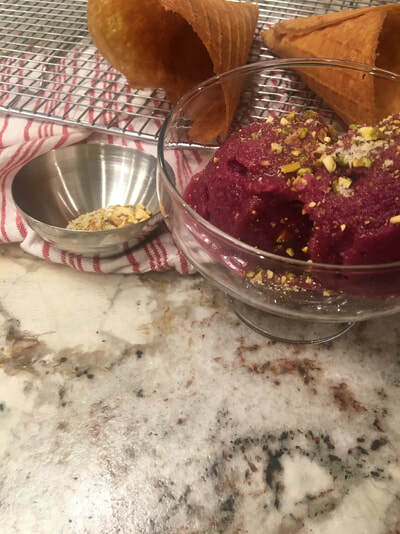 Once I made the prickly pear juice, the sorbet was super easy to make. So, if you want you can substitute your favorite juice into my recipe and make your own tasty sorbet! Bonus...this recipe is soooo simple, you will never by sorbet again! 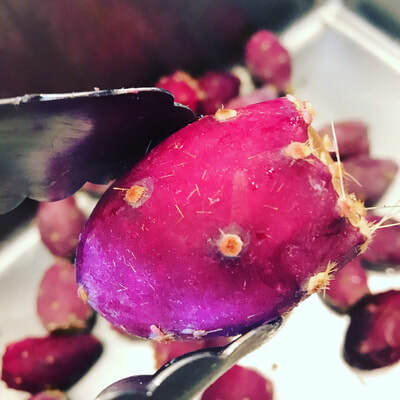 The prickly pear has lots of very small hairlike thorns that detach easily...so be careful when working with the fruit. To be safe, I used tongs and heavy-duty gloves to handle them. Transfer to resealable container and freeze 3-4 hours. That is it! Pretty simple, huh? And equally amazing. I had 20 prickly pears which yielded about 6 cups. Clean and scrub the fruit completely and thoroughly. Place the entire fruit into the blender. Blend until you have a pulp. The consistency should be like applesauce. Strain out the seeds and fibers using a strainer or cheesecloth. Compost/discard the pulp. Do not try to handle fresh Prickly Pear without gloves. You will be tweezing those glochids for days. 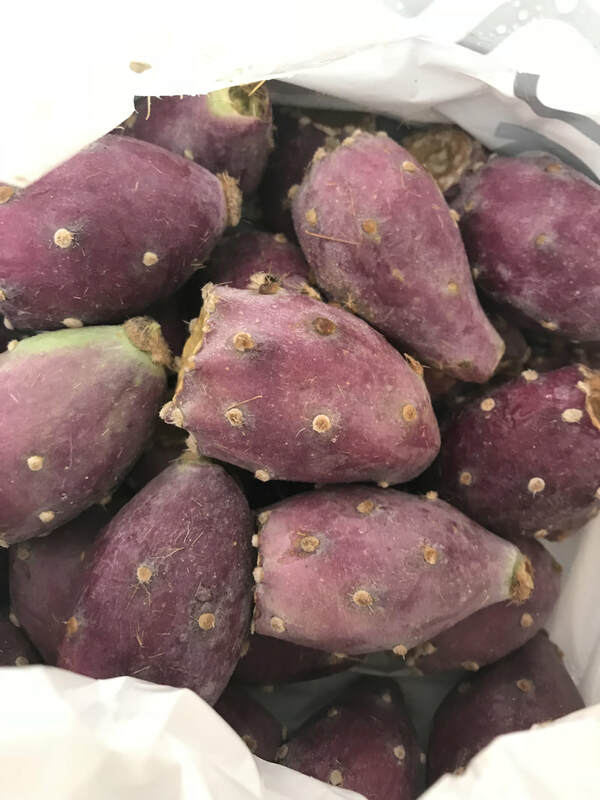 ​Prickly Pear juice can be found at gourmet/specialty grocery stores and can be substituted in for fresh. Make your own sorbet using your favorite purée. Feel free to Emanate!